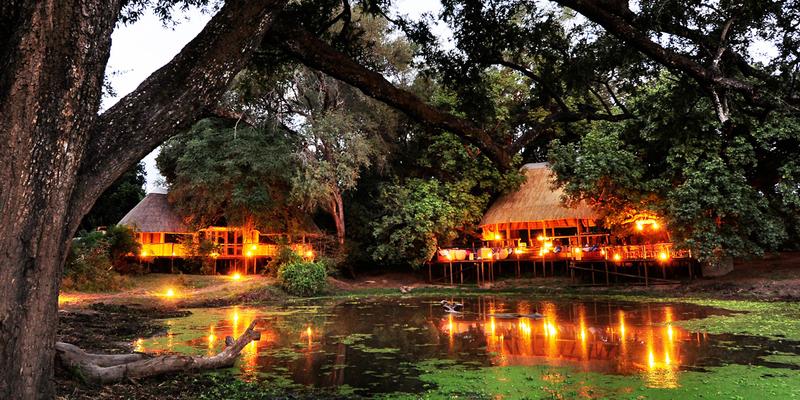 Blending seamlessly with its surroundings and perfectly positioned under the shade of majestic mahogany trees, Bilimungwe is a superbly comfortable bush camp in the remote southern part of the South Luangwa National Park in Zambia. With a small plain on one side and a series of three productive waterholes on the other this beautiful camp offers unrivalled wildlife viewings, and is home to award-winning guide, Manda Chisanga. From the huge mahogany tree that forms the centrepiece of the communal lounge and dining area, to the exquisitely carved, locally-made, bowls and shelves in the lounge and chalets, Bilimungwe, or ‘Bili’ as it’s more affectionately known, is all about the natural, warm and welcoming feel of wood, and it’s hard not to be seduced by its charm. Activities at Bilimungwe usually consist of a safari walk in the morning and an afternoon game drive combined with a night drive, although there is a degree of flexibility if guests prefer alternative arrangements. Both activities are given equal weighting, but traditionally walking has been considered the camps main activity, which is particularly good in the area. Over the course of a few days there should be decent sightings of lions, leopards, jackals, spotted hyenas and elephants, as well as a wide range of lesser game. The varied habitat around Bilimungwe, including areas of forest and numerous waterholes, means the birdlife is varied and prolific, great for bird watching. The resident guide at Bilimungwe is usually Manda Chisanga, who was joint-winner of Wanderlust magazine's Guide of the Year in 2006. Manda is a fantastic all-round guide; he spends time explaining everything from how claw marks in a tree trunk show a leopard's routine to the medicinal properties of plants. A particular feature of this camp, presumably because of the presence of Manda, is that the staff sometimes put on a 'show', with traditional dancing and singing, much to the delight of the guests. Each of Bilimungwe’s four chalets feels as though it’s grown organically out of the surrounding landscape and overlooks waterholes, where the birds and animals frequently visit. These are spacious structures on raised wooden floors, with reedwork half-walls and a thatched roof. Inside the space is large and airy, with a vaulted ceiling, supremely comfortable yet still retaining an authentic bush camp charm. All are integrated into the shady landscape with the dark wood of the mahogany trees echoed in the beautiful wooden furniture, handmade by local artisans. Bright African textiles bring splashes of colour to these elegant rooms. At one end there is a comfortable lounge area, the bed with its mosquito net is to the centre, whilst the indoor bathroom featuring an open-air waterfall shower is at the other end. Double doors lead out to an expansive viewing deck immediately overlooking the waterhole. Two of the chalets have twin beds (queen-sized beds), while the other two each have a king-sized bed. The central area at Bilimungwe is a thatched, open-sided structure, which is raised on wooden decking between the trunks of tall winterthorn and mahogany trees. There is a comfortable lounge area with cane furniture and African-print cushions, a well-stocked bar and a huge dining table with a great chameleon centre piece – Bilimungwe means chameleon in the local ‘Kamanga’ language. Down a few steps is another deck with built-in seating, scattered with cushions, creating a quiet area overlooking the waterhole. On a nice evening, meals might also be enjoyed here under the stars. Just a stone's throw from the main area, overlooking an open plain behind the camp, is the firepit.